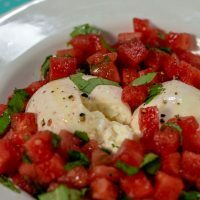 Watermelon and cheese may not seem like two ingredients that go well together, but this refreshing Watermelon Burrata Salad will change your mind! I can’t believe it’s already the end of July! Less than one month until my son starts back to school (first grade, here he comes). In the meantime, we’re making the most of summer with trips to the water park, camping (well, Liam and Daddy went camping), eating outdoors, and backyard grilling. We switch up what we grill, sometimes steak, sometimes chicken, sometimes burgers. We might serve corn on the cob, or potato salad, or fresh fruit salad. But once a week every summer, the same old things can get, well, old. 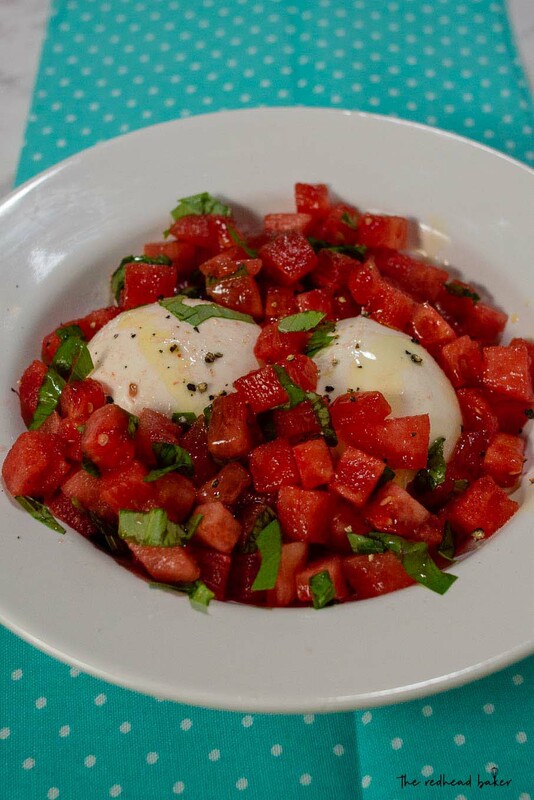 If you’re bored with the usual cookout side dishes, try this watermelon burrata salad. I know, I know …. watermelon and cheese? Together? Are you serious? Yes! This salad’s flavor is amazing. With only five ingredients, this salad’s flavor is complex yet light. The textures of the ingredients are quite different, yet complement each other well. The olive oil combines with the watermelon juice to make a sort of vinaigrette. If you’re not familiar with the burrata, it’s basically an outer pouch of mozzarella with cream and curd in the middle. It’s often found in a plastic container with the specialty cheeses in your local grocery store. Burrata is best served as-is (not baked or melted) at room temperature, because when it’s sliced open, the creamy curd spills out into the salad, which makes it perfect for summer get-togethers. Gently toss the watermelon cubes with the basil. Place the burrata cheese in a shallow serving bowl. Gently pour the watermelon/basil mixture around the burrata. Drizzle the olive oil over the salad, then season with salt and pepper. Welcome to Progressive Eats, our virtual version of a Progressive Dinner Party. Each recipe in our menu this month features foods for a Summer Barbecue. Our host this month is Carol from A Chef’s Kitchen. I love this combination of ingredients! 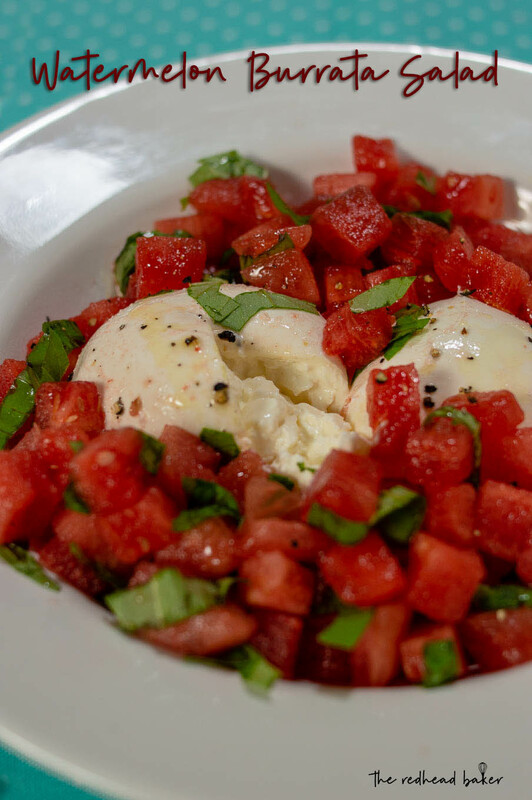 Burrata is a fabulous addition—it must taste amazing with the sweet watermelon cubes! Your watermelon is such a beautiful deep red color. 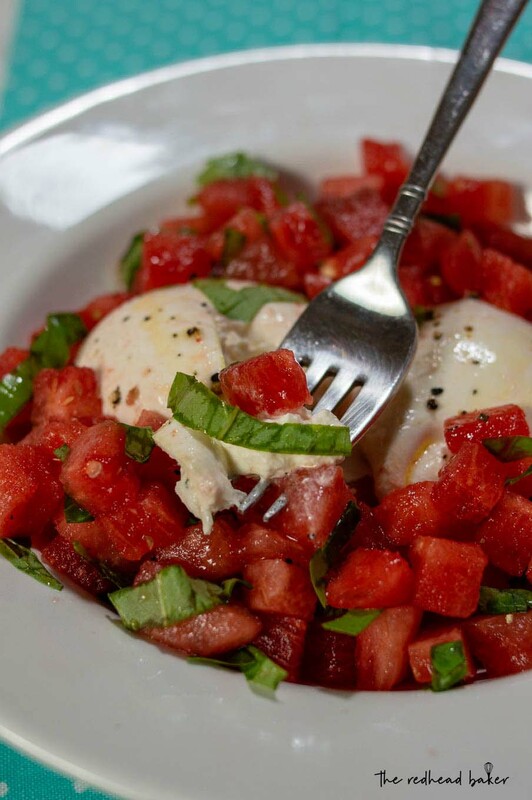 The burrata with the watermelon sounds delicious! I’ve actually got burrata in my refrigerator right now that needs to be used. This looks like the perfect way to use it! The addition of the fresh basil sounds lovely! 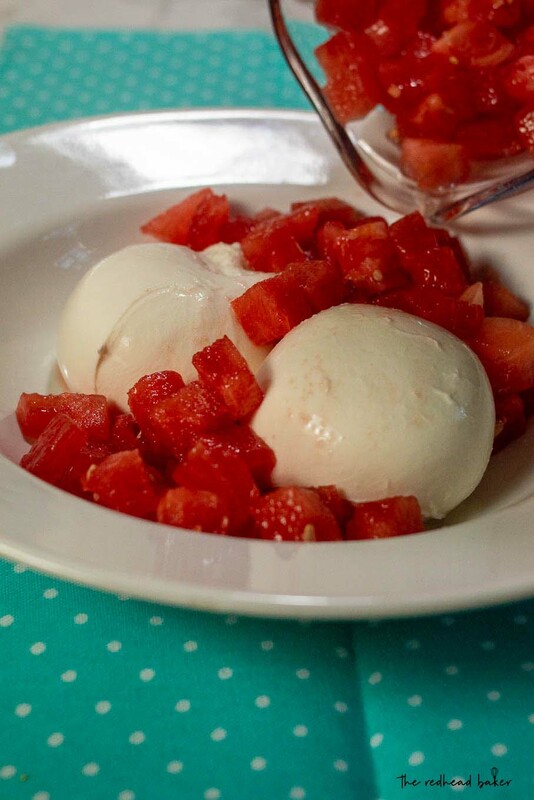 Burrata makes everything so special, but I’ve never considered pairing it with watermelon!! What a fabulous idea. I love how simple this is – it allows all the great flavors to shine! This looks so beautiful and inviting Colleen. I’m actually in search of burrata; I have a recipe that calls for it but it’s being very elusive; wish me luck. I made a salad with a more pungent cheese, Gorgonzola, but I can only imagine how delicious the smooth creamy burrata is too…I’ll have to put it next on my list!